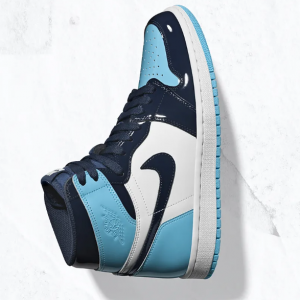 Nike offers Women's Air Jordan I BLUE CHILL for $160. Available 2/14 at 10:00 AM EST. The silhouette that started it all shifted the paradigm of footwear when it debuted in 1985. Honoring MJ’s beginnings at North Carolina and celebrating the NBA All-Star game in Charlotte, the upper is flooded in patent leather and the “Blue Chill” colorway is a twist on the typical North Carolina blue. Since his game-winning shot that brought championship glory to North Carolina, Michael Jordan has been at the forefront of basketball consciousness. He took the court in 1985 wearing the original Air Jordan I, simultaneously breaking league rules and his opponents' will while capturing the imagination of fans worldwide.